It's that time of year where it is extremely hot for not only humans, but for our furry friends as well! While we humans can cool off by sweating, this is not true for dogs. Our dogs cannot cool themselves by sweating. They cool themselves by panting, but when it is extremely hot and humid, panting is not enough. 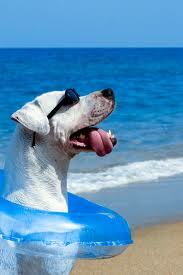 It is our responsibility to ensure that our dogs stay cool, comfortable, safe and happy! When outside, always provide a shaded area for your dog. Make sure that the area has plenty of ventilation. Also, always provide cool and fresh water for your animals to drink. If you keep water outside, change is regularly to ensure it is refreshing. If you are fortunate enough that your dog likes to swim and more fortunate enough that you have a pool, a refreshing swim will cool off your dog as well as provide some exercise. If you don’t have a pool, you can use a kid’s hard plastic pool. Keep the pool in a shaded area and change the water often. Always supervise your dog when around water; never let your dog in the water unsupervised. Your dog should always know how to get out of a swimming pool. Treat your dog around water as you would a child. Keep an eye on your dog and make sure he or she stays cool!